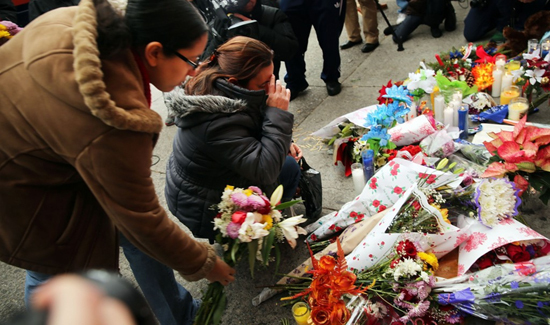 Grief-stricken New Yorkers mourn the loss of NYPD Officers Rafael Ramos and Wenjian Liu. Our nation’s battered and bruised, black and blue. but the pain felt will never fade. devastated the minute it rose the gun. Is this the justice you desire? Destroying oneself by fire. Change by violence, is utter nonsense. Execution. Cowardice denies the prosecution. I look at my world in such disgrace. Where is love? Where is humanity? One more news story and I’ll lose my sanity. Black lives matter, but so do blue. The more we demolish, the less we can undo. ending with nothing but loss. No survivors, no winners, no spoils. the world is beyond repair. brothers in blue, forever they will stay. Michael Nicholson is the son of Dave Nicholson, the Funds Administrator for the PBA of New York City. Dave is a retired Sergeant. His partner, Keith Levine, was killed in the line of duty 23 years ago on December 28, 1991.